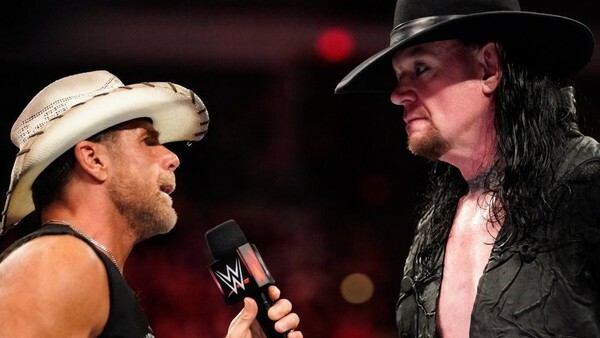 Shawn Michaels made his presence felt in the current programme between Triple H and The Undertaker when he predicted that his best friend would triumph over 'The Phenom' at Super Show-Down. He based his prediction on the fact that he believed 'The Game' had a lot more left in the tank than 'Taker, which is actually a plausible explanation. However, this week on Raw, Michaels further explained his choice and this is where the cracks started to show. The 'Heartbreak Kid' claimed that while he respects The Undertaker, he would pick his best friend "over anybody on the face of God's green earth" on any day of the week. Well now, that's not entirely true, is it? Let's cast our minds back to 2011 when Hunter directly asked Shawn to tell The Undertaker why 'The Cerebral Assassin' would defeat him. A shaken Michaels, knowing what 'The Deadman' was capable of, couldn't dignify that with a response and, instead of supporting his best friend, he exited the ring. Now, given that Triple H has lost two battles against The Undertaker since then, why would Michaels suddenly be more convinced than ever that he could beat him? 'HBK's original reasoning worked perfectly, but by over-explaining it, WWE have once again tried to erase a part of rather well-documented history from existence. They really should have just left it alone.